Congratulations, Keenan, on your debut book . . . it sounds quite intriguing and I’m looking forward to reading it. I love the idea of a Good Things jar, it’s such a positive thing. Two of my grandchildren lived with us for about a year when they were quite young; one of our nightly rituals was remembering the best thing that happened that day. It wasn’t necessarily something big, but they both looked forward to sharing that special thing . . . .
I’m curious to know what drew you to Alaska?? Hi Joan! During law school, I decided to look for a new place to live, having been in northern California area since I was nine years old. But I was a military brat, so moving again felt right when I graduated law school. During our summer vacation in 1980, I drove cross-country looking. In 1981, I flew to Alaska to visit a friend. Even before we landed, I took one look at the Chugach mountain range that borders Anchorage, and knew this is where I wanted to be. I came back the day after I graduated in 1982 and have been here ever since. That "what good thing happened today" ritual sounds like a great idea... for grownups too, trying to shut down the brain for the night. Making the list is a feel-good way to close out the day. All the irritating little things that accumulate lose their importance. Congrats on your first novel. The description of the story sounds quite intriguing. I don't have anything like a Good Things Jar though. What a lovely essay--your grandson hit the jackpot! And I too love the good things jar--it makes gratitude so concrete, which is sometimes what I need. Congrats on the new book! Thanks so much, Lucy. We enjoy sitting at the kitchen counter listing the things that will go in the jar. Just making the slips is uplifting. I love those traditions you're setting up with your grandson. Best of luck on the new book. My good thing today would be having my book nominated - along with Rhys - for an Agatha Award for Best Historical Novel! A huge congratulations to you, Edith! That is a big deal. We're going to have a great Malice, again, this year. Good luck on the book. Alaska fascinates me, has held a prominent place on my bucket list for ages. And what Lucy Roberta said about your grandson. You seem to be making life so good for him, not easy when you inherit a 12 year old child. I envy you having the energy to paint, play the harp, write, work and still find the energy raise another generation. Kudos. Thanks Ann. Sadly, the painting and harp fall by the way side when things get busy. I feel your pain with four inches (and more?) I keep telling myself every time I shovel the driveway that it's another cookie I can eat. Snowing here in Boston, 2" and counting. Fluffy. It will be my day's exercise. Thanks so much, Hallie and Reds, for having me! I have no idea why my wordpress ID today won't work so I fell back on the law office one. 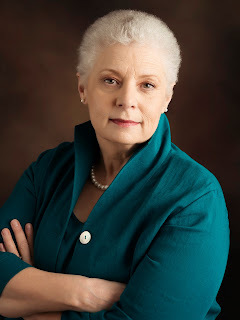 That is me, all suited up to look lawyerly. Love your lawyerly look, Keenan! We were in Alaska last year and had a fabulous trip. I wondered what it was like living in a place so dependent on tourism. And how does weather fit into your storytelling? Glad you had a good time in Alaska! I dare say weather is a character in my stories. I think Alaskans are more in tune to the land, the wildlife and the weather. Perhaps it's because Alaska attracts people who are or because the cyclical changes are so dramatic that every day feels different. The light has such a dramatic impact on the wildlife, even the urban wildlife, as they scurry through those few precious weeks of summer to get ready for the next winter. In Anchorage, it's every day to see moose, bear, eagles, rabbits, beavers and fish. Ravens live in Anchorage in the summer and then move up into the mountains in the winter when the geese and seagulls arrive. It's like living in one giant Planet Earth production. DEADLY SOLUTION is set in the summer when we have up to 19 1/2 hours of daylight. Book 2 is set in January following a blizzard and then Chinook winds (big warm winds. In book 3, Maeve goes to Seward, Alaska, and gets caught in the tail end of a hurricane. Congratulations, Keenan! The Boy took my iPad yesterday and I was so mad because it meant I couldn't continue my reading. I'm loving Maeve. Thanks, Mary. Sorry about your son snaking the iPad. Sure, come on up. One nice thing about Gwennies is that you won't need to eat again for quite a while. My favorite is reindeer sausage: grease, garlic, salt. Yum! Keenan, congratulations on your first release!! I've had the pleasure of reading a few series set in Alaska--looks like I've found a new one! My two youngest nephews came to live with me full-time about seven years ago. I try to practice the 'Three Gratitudes', remembering three things from my day in gratitude before I fall asleep--and have tried to instill the practice of gratitude in the boys as well. Like Ann Mason, today I'm grateful that there is less snow than expected and that the plow made its way down my road! Thanks, Flora! Your comment made me laugh because I learned to love the sound of a snowplow and can hear it even now at 5:35 AM! Hope it stops snowing where you are very soon. Thanks, Petite. I am one lucky grandma. Keenan, it's obvious you are a brave woman. Alaska in 1982 took significant courage to move to, especially for a woman, and with no real connections there at the time. And raising a preteen-soon-to-be-teen boy, as well. My grandson is the same age, turning 13 in February, and we agreed a long time ago to raise him, if necessary. Always hoping that doesn't end up becoming necessary for us oldsters, but I know it would be a very real challenge. Seems that you are doing all the right things out of the starting gate. 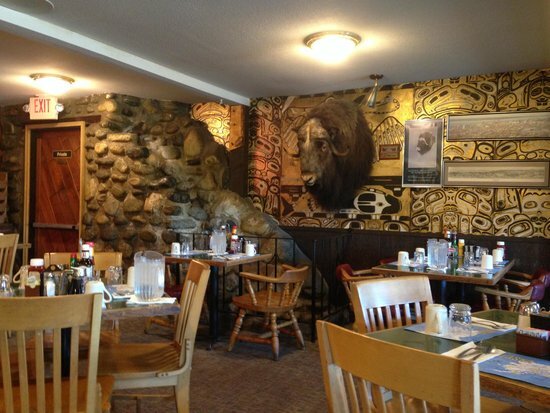 That muskox looking over diners' shoulders, though. So looking forward to reading this book. Best of luck to you, in all your endeavors. Thanks so much, Karen. When I came to Alaska, I had a friend up here from Vacaville, where we went to high school. She was originally from Alaska and had moved down with her mother when her parents divorced. Their home was full of Alaskana paintings and it was all they ever talked about. So when I came up here, I was lucky to fall in with her long-time friends, many of whom were born here, who taught me how to drive and what to wear. I'd have been lost without them. I can't imagine being homeless in Alaska -- so cold! Alaska has looked to me like the wild west, not urban, but of course there are cities. This book sounds amazing! Thank you! Just about a year ago, my husband set up a group email with our four daughters so that we could, each day, share some "positivity." We are no longer doing it, but it was a big help throughout the first half of a certain administration. I used to keep nice notes from my students' parents in my desk drawer so that when I was confronted by angry parents I could find some solace. Thanks, Denise. It is difficult for the homeless in the winter. Anchorage is the largest city with almost 300,000 people. Fairbanks and Juneau each have 33,000. In Anchorage, we have one overfull shelter but many of them camp in abandoned lots or parks year round or find abandoned cars or warehouses to live in. I like the group email you started. Focusing on positive makes me feel so much better even when I was a young lawyer and the only positive thing I could come up with is "I have a lot of paperclips." The book sounds like something I could sink my teeth into! I don't have a Good Things jar, but I do have a similar habit: each morning when I get up I give thanks for being alive, for having a roof over my head, for my job, health insurance, etc. If something special happens during the day, I make sure to give thanks for that. For example, I was hit by a car a few days before Christmas and am still being treated for some of the injuries-- but I didn't suffer any broken bones or head or spine injury and I'm grateful for that every single day! Thanks, DebRo. So sorry to hear about your accident. It sounds like you were very lucky. I slipped on the ice a few years ago and broke three bones in my hand. It could have been so much worse. The human body is a fragile thing indeed. You are a real adventurer and your grandson's life is richer for living with you. I live in NM. Do you remember NM? The climate is lovely and the skies blue. I cannot manage the cold etc. It sounds strange since I am originally from Mtl. Best wishes. Thanks, Traveler! My father was transferred from Walker AFB when I was six months old so I don't have any early memories of it. But I drove through in 1980 and thought it was so fiercely beautiful. Can't say I like cold weather either, but I can't handle heat. So it's a trade-off. Most of the time at least. Right about now, the cold is really getting on my nerves. I love the idea of a Good Things Jar but have never kept one. And congratulations on your debut book, it sounds like a fun read. Thanks so much, Lil! 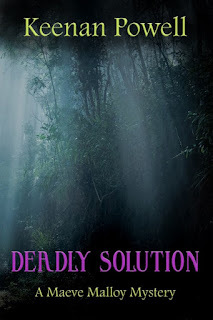 DEADLY SOLUTION has been getting positive responses. I am so happy that people like it. Thanks so much, Rhys! I tell all the mystery writers I know how valuable the Book Passage conferences are. I don't think I'd be here if it hadn't been for the conference and the chance to meet with you and Hallie and the other instructors. We count our blessings every night -- it can be something as simple having a safe daily walk on our property with our dogs (they are off leash then), or the beautiful bald eagle that has decided to reside across the river from us. When I was about 14, I moved in with my Grandmother & Grandfather because they lived near my school, (and a boy I had a huge crush on) for about a week so I could walk to school by said boy's house each morning. They were very gracious about having me, and it was nice to be away from my 4 sisters for a while. Every morning, Mimi would make me bacon, fried eggs and grits, and it was wonderful. Thanks, Celia. I'm hoping decades from now my grandson remembers the smell of frying bacon when he thinks of me. I most remember about my grandma is her coming out of the kitchen with a tiny bit of frosting on her nose. It still makes me laugh. Keenan, I love your grandson's bacon comment! Maybe I should try that with my husband. Congrats on the new book! Maeve sounds like a fascinating character, and I'm adding the book to my TBR. The Good Things Jar is a terrific idea. Doesn't research say that just the act of gratitude makes you happier? What a wonderful practice to teach your grandson! Thanks, Ingrid. Focusing on gratitude does make me happier and sharing it with the boy makes the experience richer. I hope you enjoy the book! Kudos to Rhys and Edith on their Agatha nominations. And may the best Red win!!! No problem Ann! Rhys and Edith deserve a big pat on the back! Keenan, your Good Things jar is a brilliantly healthy idea. So many of us allow the weight of bad experiences to overbalance the good ones. We often have a mental video of worries that tends to stream around three or four in the morning. The old adage, "count you blessings," was born for a reason! When I worry about my writing career, when the words aren't flowing in my head as fast as I want, I pet the dog, look at the beautiful view outside my office window and thank my lucky stars that we own such a nice home, that somehow I have five published books and one coming in April. When negativity tries to take over the conversation in my head, I do a mental replay from back in the day. I remember one of my horses coming down the lane on the lead and winning a race. Then I say to myself, "Now shut up and keep writing!" Congratulations to you on your new book! I bet there'll be many more to come, so keep writing! Thanks, Sasscer. You must have a strong mind! I'm currently doing a final tweak before I turn in Book 2 to the publisher and then on to Book 3! Book three? Excellent! Don't know if my mind is strong or not. More like tired but determined. Congratulations on the new book, Keenan. I love the traditions you've started with your grandson, particularly the Good Things jar. He must feel safe and happy with you. I took a mindfulness for writers class once, and one of the suggestions for writers who are struggling was, when you finish your writing for the day, think of something you wrote that day that you're happy with. It could be as concrete as a sentence or a few words, or as abstract as an ambiance you've created. Even if I hate most of what I've written that day, I can always find one good thing and it helps to view my writing in a positive way, and makes it a little easier to start the next day! Anyway, a little off topic, but it seemed somewhat related. Best of luck with the new book! Thanks, MaryC! I like that suggestion. I also heard somewhere to quit in the middle of something that is flowing well so it's easier to pick up the next day. First of all, congratulations on the book, Keenan! I picked it up a few days ago when you appeared on Dru's blog and really look forward to reading it soon. Also, the next book in the series sounds wonderful as well. Sounds like you and your grandson are making some great memories! Bacon, Good Things (important to think about those and writing them down will cement the memories better), and that great restaurant each Saturday! Thanks for showing us a picture of it. Wish I could visit. Oh, one thing I realized - think you and I might have been partners in time monitoring a panel at Malice last year. I was looking through my little book and had noted the name 'Keenan' next to a panel. It was my first year there and I had been a little ambitious in my volunteering. Had back-to-back panels to help with. Ha! Anyway, I suspect we've crossed paths. Hope to see you again this year - I'm registered and ready to go! Thanks, Kay! I hope you like the book. Malice was a whirlwind and I'm sure we met. I'm registered and have a room. Wouldn't miss Malice and I'm really looking forward to the new hotel and the line-up. I don't know if it's possible to have any more fun than last year, but if it is -- we will. Keenan, DEADLY SOLUTION sounds like a must-read - and I for one am not surprised that the streets of Anchorage can be mean! When my family and I went for the 2007 Bouchercon there, there was a shooting (followed by police response, arrest, whirling lights, etc.) on the street outside our hotel. My kids took a cruise to see glaciers, a floatplane to Denali National Park, and visited the wildlife rehab center, but believe me, the shooting remains a high point of their visit. Oh my goodness -- I wonder where you were staying! Last summer, I took the grandkids to the wildlife rehab center and then down to Seward Sealife Center where we saw a recently rescued baby walrus. On another trip, we took the boat cruise out of Seward whale-watching. Grabbing spotty internet to say hi! Aw, Keenan, that is lovely..and I adore that idea! And your name will be the first thing in it. Congratulations! Thanks, Hank. And thanks for having me on Jungle Reds. This is an event on my dream-come-true list. Safe travels wherever you are! I learn something new about you every day! Love the traditions you've created. Thanks, Harriette, and thanks for dropping by! I haven't made it to Alaska yet but it is on my list! My mom lived in Roswell, pre ET visits, and really liked it. That was during the Depression and her family moved around a lot in Texas and eastern New Mexico. Anyway they lived there a couple of years during her high school days and she had a good time. I read about your book on Dru's blog too! I am putting it on the TBR list! Thanks, Pat D. ET or no-ET, Roswell is a magical place. Hope you enjoy the book! Congratulations on your new book Keenan! I'm looking forward to meeting Maeve. Thank you for sharing about your new adventures with your grandson. We grew up with a Good Things (encouraging quotes, things we were thankful for, happy memories, etc.) jar and I think it's wonderful that he will too. Many blessings on your new times together and for you as a writer. Thanks, Hillary! I hope the experience sticks with him as it stuck with you. And I hope you enjoy the book! Thank you, I'm confident on all fronts... Enjoying the book and that it'll stick with him. That said, I think I'll tell my mom how much the jar meant to me, she might not yet know. Thank you for the reminder! So many interesting things to comment on here today. First, congratulations, Keenan, on your debut book. Its setting of Alaska peaks my interest. I haven't read but a couple of books set there, and I enjoy getting outside of my setting comfort zone. And, of course, the story is intriguing, too. Your wolfhound and harp and Good Things Jar are also great points of interest. I'd love to hear more about the wolfhound and the harp. The jar is an idea I'm going to pass along to my daughter and her teen. Thanks, Kathy! The wolfhound: When I was 12 years old, the family visited my grandparents and I saw a drawing of an Irish Wolfhound in an old AKC book. From then on, I wanted one. After my kids were grown and their dogs died off, I got my first. His name was Liam. He was a valiant companion and the doggie love of life. He passed away at 6 1/2 from bone cancer. I had bought in a companion, another IW. Her name was Darcy. She had several medical issues which ganged up on her and also got bone cancer and she died at 7. Now I have Fitz, who I love dearly, but he herniated a disc in his back when he was two years old so he's living on medication and can't go for walks anymore but he is still a happy and loving boy. He's four. He has his own couch but insists on sitting with me on mine, preferably on top of me. The harp: when I was three years old, I told my mother I wanted to grow up to be an angel and fly around with wings and play the harp all day and she said I couldn't. OK, fine. Then 30 some-odd years later, I saw a woman playing the folk harp in the mall and I told my 8 year old daughter the story. So she goes up to the woman and asks her to teach me harp and gets her card. (Fortunately I never mentioned to that kid that I had once wanted to parachute out of a plane.) So I took lessons, performed Celtic music with a partner for a while, then got a pedal harp and took lessons for a while. Now I just noodle around for my own pleasure. I prefer playing songs with lots of arpeggios. When I quickly read the last line in your bio, I thought there was a new "Tide challenge" going around. Put a "r" in dinking and you have "drinking oil paints"! Next, check out the "Red Elvises" on youtube and their song "Smell the Bacon". It's quite catchy and if you ever go to Key West to visit Lucy/Roberta, you might be able to hear them play at the Green Parrot. Of course they play other places but nowhere as fun. Lastly, congratulations on your book. I will look for it. Thanks, Pam! I will look for that song. Hope you enjoy the book! Congratulations, on the book Keenan. It's going right on my buy list. A visit to Alaska many years ago, made an enduring impression,and I can hardly wait to read your story. We did meet a number of people there who fell in love with the place at first sight, as you described. My husband came pretty close to becoming one, too. I Love the Good Things jar and wish I'd thought of it when my kids were young. Thanks, Triss! I wish I'd thought of the Good Things jar when my kids were young too, but you know what it's like raising kids: constant crisis management. It used to be I knew dinner was ready when the smoke alarm went off. Congratulations! I wish you success with your book. Thank you Daniella! Early results are encouraging. I love the idea of a Good Things Jar. It's so important to be grateful for the good things in our lives, especially when the bad sometimes threaten to overwhelm us. It's wonderful that you're passing that insight on. Congratulations again, Keenan! And good job making Alaska real through the pages of your novel. Thanks, Jenni. We plant seeds with these little creatures and watch them grow. I love the idea of a Good Things Jar. I used to journal and would include a weekly gratitude entry, but I haven't done it in years. Might be a nice, short monthly blog post I can do on my personal blog though, so thanks for the idea. Thanks so much Mia! It's easy to fall out of the habit doing the list when you have so much to be grateful for, but then I find, I sometimes slip out of the habit of being grateful too and have to redirect my thoughts. My eldest niece moved to Alaska last fall, as a traveling nurse. She'll be in Anchorage for two years, so Alaska is very much on our minds these days--suddenly we are more aware of issues affecting indigenous people, and hearing more stories about Alaska on NPR and at the quilt shop. I am hearing that Anchorage has some "mean streets", by the way. I'll be looking for your book! Thanks, Beth! Yes, there was some recent press about the mean streets and if you are in close communication with your niece, you'll know the last few days have been especially bad. Fingers crossed, the pendulum will swing the other way soon. Marian, thanks so much! I hope you enjoy the book. Congratulations, Pam Christie! 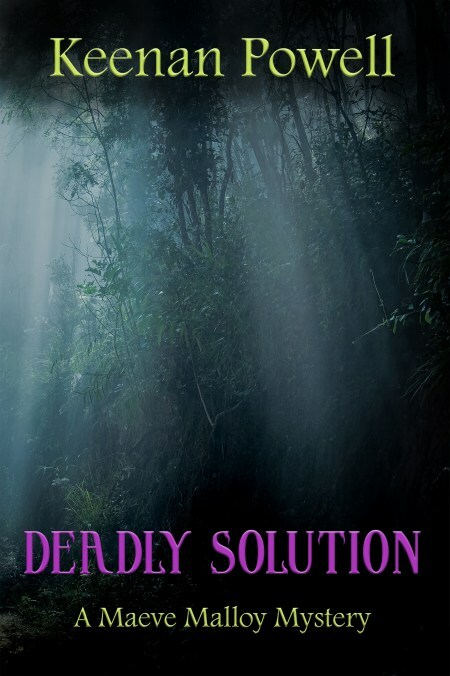 You won the drawing for a copy of DEADLY SOLUTION. Please email me at keenan@gci.net so I can arrange delivery.